"You discover a remote temple on the wind swept desolate mountainside. Inside you find a small devoted band of monks dedicated to life, healing and their incessant worship. Seated at bells the monks intone in a rapturous state. It seems nothing will rouse them except the honest pleas of the truly innocent and worthy. 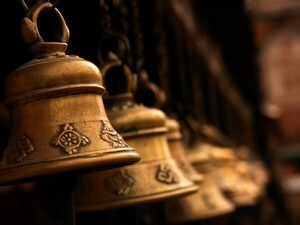 Quite why these monks have not been murdered and their temple looted of it's beautiful bells, which I might add, look suspiciously like they are made from solid gold is beyond you. Perhaps they are protected by some high power? Perhaps the higher power is enjoying their song?" This SoundSet was imagined, compiled, designed, created, mixed and finished by Benjamin Loomes of syrinscape.com, using samples created by him and his kitchen. Thank you to Tarek on the forums for inspiring this one!